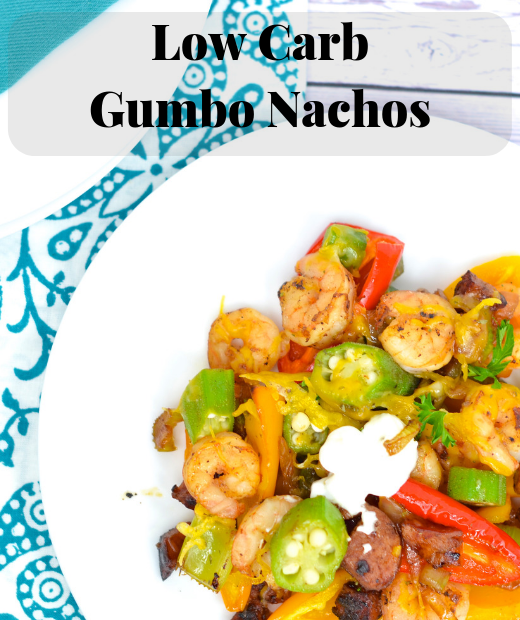 This step by step recipe for preparing low carb gumbo nachos is super easy and amazingly delicious. You won’t believe a serving of this dish is only 4 net carbs! Before scrolling down to the recipe, be sure to read my easy tips for making your recipes low carb, keto friendly and delicious. QUESTION TIME: Who loves nachos? I am a huge fan of nachos. Along with pickles (remember my Air Fryer Low Carb Pickles recipe), nachos was my choice of snack at ANY festival, ball game, movie, etc. Mr Skinny Louisiana would agree. While he likes nachos and does not love them like I do, a little over 6 years ago, he was asked to prepare nachos as our celebration meal when we found out we were pregnant with Christian. So yes, nachos has a special place in my heart. I wanted to add Louisiana flare to our nachos! 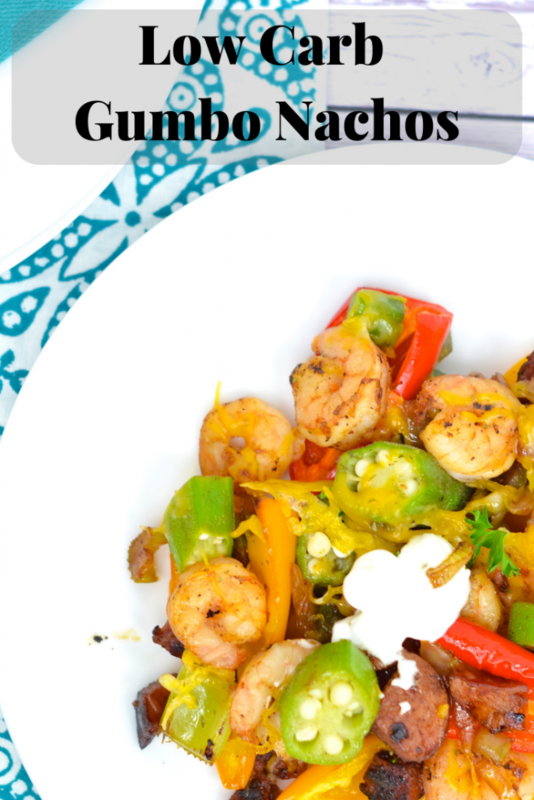 Gaining popularity in many Louisiana restaurants is the Gumbo Nacho. Combine the amazing trinity, seafood, sausage, and okra – this is a wonderful, mouth-watering appetizer. 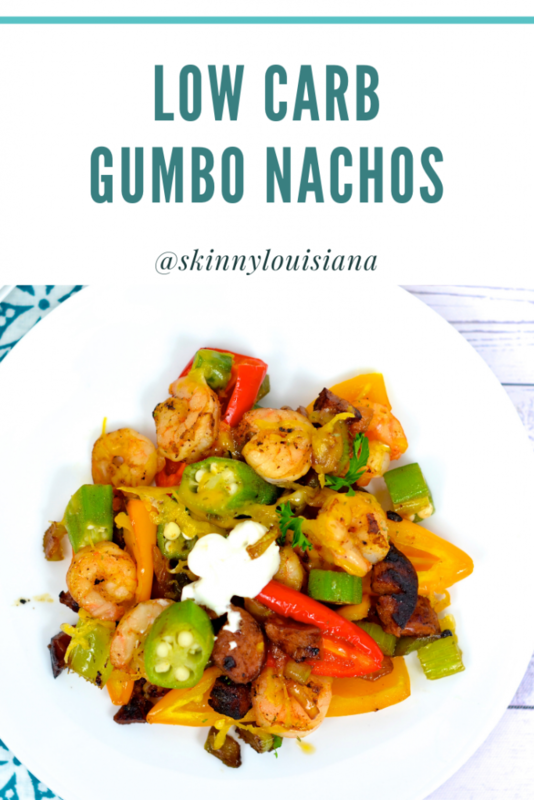 It’s time to take Gumbo Nachos to the Skinny Louisiana drawing board! 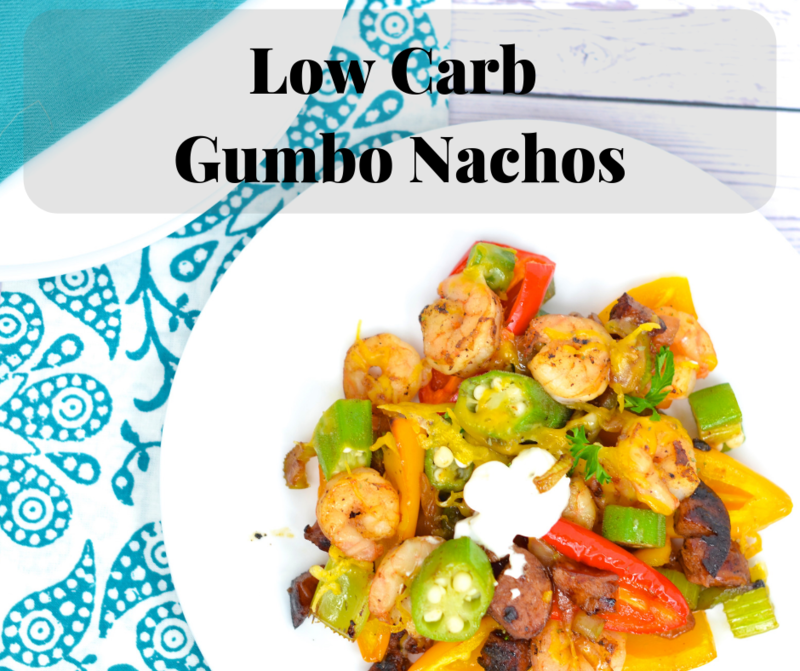 Using a few simple substitutions, we have an amazing Low Carb Gumbo Nacho recipe the entire family will love. Let us know in the comments below if you have tried our recipe! Before I go over ingredients, know the items used in this recipe can be found at many of your local supermarkets and Drug Emporium. Many of you know my love of Drug Emporium stores. Not only does Drug Emporium have amazing prices (often the cheapest in town), I work with this amazing company in putting on Low Carb Food Demonstrations and product selection for shelves. All my items in the recipes are from Drug Emporium. For a full list of Drug Emporium store locations, click here. No Drug Emporium in your town? No worries, you will be able to find these ingredients at your local supermarket. While supermarkets do have a selection of seafood, make sure you are purchasing Gulf Coast and/or Louisiana Gulf Coast seafood. Do not purchase seafood from foreign countries since often it is treated with salt solutions to prevent formation of ice crystals. Chips are the basis of any nacho recipe, and while we love the crunch, the carbs in chips makes us run away very fast in the low carb world. A serving of tortilla chips yields 12 grams of carbs and 0 grams of fiber but we must be honest, who eats 1 serving? No one! We used our mini peppers in this recipe with a serving (6 halves) yielding approximately 5 grams of carbs and 2 grams of fiber (depending on size). While oil is a low carb item, we specifically use olive oil for its heart healthy properties. 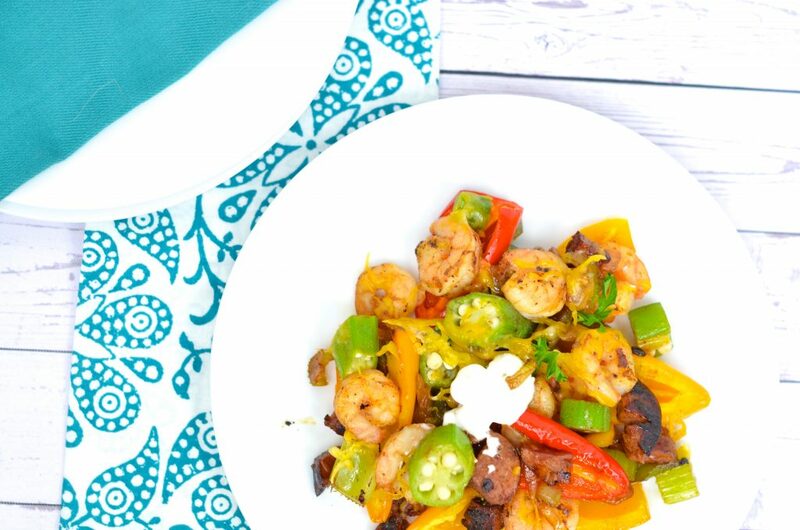 While many of us recognize shrimp as a protein and not a high carb meat, many question, ‘Is this an ok meat?’ Shrimp is an amazing source of protein with three ounces of shrimp yielding 0 carbs and 20 grams of protein. While it is tempting to look in our supermarket freezer section for shrimp, make sure the product is raw and from the coast. Often, shrimp imported from foreign countries have been treated with a salt solution to prevent ice crystal formation. I need SPICE! 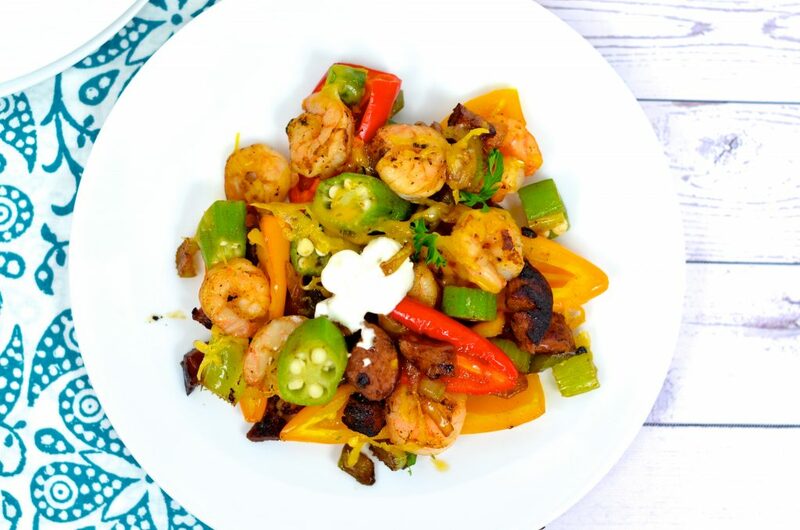 Containing zero carbs AND a whole lot of kick, Tony Chachere’s BOLD Creole Seasoning gives this dish a POW without hiking up the sodium content. While my keto friends will opt for the full fat version of this cheese, I do enjoy saving calories by using a 2% version. Following in saving calories, I do use a light sour cream. Keto friends are welcome to use full fat sour cream. Preheat oven to 350 degrees. Make sure your peppers are sliced LENGHTWISE. We used 9 peppers (18 halves). Line baking sheet with non stick aluminum foil. Place peppers on sheet. Spray with non stick cooking spray. Cook for 15 minutes. Remove from oven and place to the side. Place a large skillet on the stove and set heat at medium. Add oil. Add onion, green pepper, and celery. Sauté 5-7 minutes. Add low sodium sausage. Sauté 5-7 minutes or until sausage starts to brown. Add shrimp and Tony Chachere’s seasoning. Sauté 5-7 minutes or until shrimp are pink. Pour mixture over peppers (be sure to place peppers next to each other). Sprinkle with cheese. Bake for only 3-5 minutes or until cheese is melted. Remove from oven. Top with light sour cream and chopped parsley. I highly doubt you will have any leftovers, but you can store in the refrigerator in any reusable plastic container with a lid. Since this recipe contains shrimp, be very careful reheating. Overcooked shrimp can become very rubbery. I would suggest removing shrimp – heating the nachos – then heat the shrimp for a very short period of time. Preheat oven to 350. Line a baking sheet with non stick aluminum foil or parchment paper. Place halved peppers on baking sheet. Spray TOP with non stick cooking spray. Roast in oven for 15 minutes. Remove from oven and place aside. In a large skillet over medium heat, add oil. Add onion, green pepper, and celery. Sauté 5-7 minutes. Add sausage. Sauté 5-7 minutes or until sausage starts to brown. Add shrimp and Tony Chachere’s seasoning. Sauté 5-7 minutes or until shrimp are pink. Gently stir in okra. Cook for 1 minute. Remove mixture from heat and pour over halved roasted peppers. Bake for 3-5 minutes or until cheese is melted. Remove from oven and top with chopped parsley and light sour cream. Nutrition Facts per Serving: Calories: 240, Total fat: 10g, Saturated fat: 5g, Cholesterol: 105mg, *Sodium: 550mg, Total carbs: 6g, Fiber: 2g, Protein: 25g. *Sodium is dependent on type of sausage selected. Compare labels and select the sausage with the lowest amount of sodium. Carb count exclude sugar alcohols. New carb count is determined with the equation total carbohydrate – total fiber – sugar alcohol. You can purchase our fabulous cookbook, Skinny Louisiana…in the Kitchen at the following link. Facebook – join our interactive community sharing recipes and video tips. Pinterest – let’s exchange recipes. You Tube – watch my fun, educational recipe tutorials and kitchen hacks. This recipe was developed and copyright by culinary dietitian Shelly Marie Redmond. She is the author of Skinny Louisiana…in the Kitchen and upcoming Skinny Louisiana…in the Slow Cooker. She practices out of Eberhart Physical Therapy which she co-owns with her husband Greg. In her spare time, she watches Snapped and Investigation Discovery.